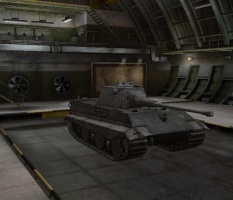 The E 50 is a German tier 9 medium tank. Following the Panther series of tanks, the E-50 was designed as a support tank. It is basically a Panther II with more horsepower and armor. These upgrades give it increased survivability in a close-quarters battle. Just like the Panther II, if you get in a dogfight ramming is a viable tactic because of your tank's weight, so you can potentially do a lot of damage. Consider this option a last resort however, as your tank is relatively slow to turn and unwieldy. 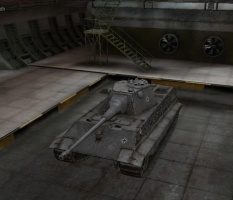 Able to use 3 of the 4 most accurate guns in the game, the 7.5 cm KwK 45 L/100, 8.8 cm KwK 46 L/100 and 10.5 cm KwK 45 L/52 Ausf. B, you can either play this tank as a long-range sniper, or a medium range support tank. 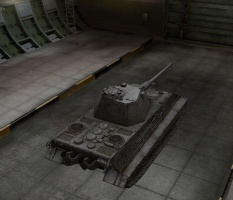 Fully upgraded your choice between the high damage, but slow firing 10.5 cm and the lower damage faster firing 8.8 cm is mostly a matter of personal preference and play style, but with the buffs to the 8.8 L/100 gun in patch 9.17.1, this gun can now be considered the top gun for this tank as it now has better accuracy, aim time and DPM than the 10.5 (it also can be unlocked from the Panther II, which is HIGHLY recommended). The E 50 leads to the E 50 Ausf. M.
Good gun DPM, accuracy, aim time, and dispersion on the move. High weight and good top speed allow for effective ramming trades. Excellent upper front plate, 80mm side armor allowing for good use of side-scraping technique. 8 degrees of gun depression allows for great peeking ability. 10.5cm top gun 390 alpha damage allows for out-trading heavies. Because of the weight and low hp, the tank is slow to accelerate, stop, turn and climb hills. 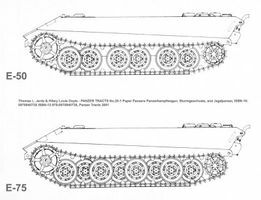 Turrer armor is only 185mm flat leaving most tier 8 and higher vehicles to penetrate it. Front mounted transmission, engine damage can be triggered from the lower plate. Both guns' base penetration remains underpowered for T10 Battles, you will need APCR rounds, however, they are very accurate. The E-50 is a massive improvement over the Panther II in terms of survivability, maneuverability, and damage, if you play it correctly. It is still not a heavy tank, but it can last a minute or two going up against tier 9 and sometimes 10 heavies. Always try and turn your hull so you're not 90 degrees to the enemy attacking, the German medium hulls are great for bouncing angled shots if the enemy is just shooting at the largest target; which is usually your hull. The 8,8 cm KwK L/100 is great for sniping, and you should use that to your advantage in long distance standoff fights with heavies as you can still make critical hits at 500m and more with a competent gunner, this will improve with the 10.5cm's increased damage. A nice fast shell speed goes with the 88/L100 so hitting moving scouts is easy and it has half decent damage output even against heavy tanks, but don't expect to win a 1 on 1 head on. Using the speed of the E-50 and its maneuverability will win you many tank on tank battles as it has decent acceleration but is hampered by slow track turn speed. Most players either look at you as a very low HP heavy tank, or a slow fat Medium tank, use it to your advantage and flank them while they ignore you or think you've run away. With the top 8.8 gun, and with a 100% crew plus rammer and vents, you get an insane reload time at around 4 seconds, which can be further lowered with chocolate. This is very good for perma-tracking other tanks, as your rate of fire is too high for the enemy unless they use their repair kit or they trained their crew for repair. While the alpha damage may seem underwhelming and tier 9, the rate of fire and penetration values (223 for AP and 261 for APCR) as well as the VERY good accuracy (about 0.29 with the top turret, 0.3 with stock) are not to be overlooked. 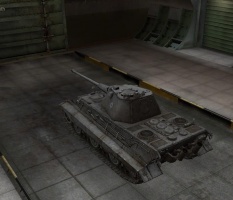 With the top gun, this tank will feel almost like an IS-3, only a tier higher, faster, more agile, German, and able to more easily swing its weight around. The 10.5 cm's alpha, muzzle speed, decent reload speed allow it to very easily pick off tanks that are nearly dead, saving other teammates a potential headache. The alpha of the 10.5 cm is equivalent to most other T10 and T9 Mediums, but again, the E50's top gun(both the 8.8 and 10.5) is the most accurate in the game. Make sure those in your line of fire feel that fact. With the top gun, Tier 8 heavies should all but avoid getting into a firefight with you, especially if you can avoid retaliation fire. Tier 9 heavies like the T-10 will also have to become wary, as you can very easily shred their health to bits. However, avoid confrontations with tier 10 heavies entirely if you can, or if possible, flank and pump shells into their backs. The 10.5 cm's very good accuracy allows you to cripple enemy tanks and possibly take out enemies with fires or exploding ammo racks, even from across the map. With the top components unlocked and installed and good playing skills, you are a force to be reckoned with on the battlefield. The turret increases your hulldown potential, as well as your damage output (37.9% gain in rate of fire on the 88mm L/100!). Once you research the Turret you can go for the 10,5cm gun which makes you a deadly opponent for nearly anyone facing you on the battlefield. Now you have the choice for what to go next if you haven't got the suspension earlier on, suspention or engine. The engine gives the tank a needed boost in the acceleration, which improves your chances to evade artillery fire and improves the ability to successful flanking enemy's. While the E-50 project did exist, there are no known records of its turret, armament or armor specifications. This page was last modified on 11 March 2019, at 19:05.